What Is ‘Closed-Loop Cooking’ & Why Is It More Sustainable? Enough bad news! A simple mindset shift in the kitchen can help you stay aware of the environmental footprint of your food and make better choices. It all comes down to “closed-loop cooking”—a phrase that I use to refer to the circular nature of sustainable cooking and eating. Closed-loop cooking means using the scraps from one project as the foundation for the next. So, for example, you could use those mushy apples (cores and peels included!) to make your own apple cider vinegar. Just place four or five chopped apples in a large jar; fill with water, leaving about 2 inches of space at the top, stir in 1 tablespoon of sugar, and cover with a cloth and rubber band. Once a day for the next two weeks or so, you’ll remove the cloth and stir vigorously with a wooden spoon. Once signs of fermentation have stopped, strain out apple pieces and bottle your vinegar. For the next four to five days, you’ll want to open and close the bottle once to prevent excess fermentation. You can mix your apple scrap vinegar with warm water for a morning digestion boost, add it to dressings and soups, and use it as a leavener in plant-based baked goods. When you make your own, not only are you giving a second life to produce that might otherwise get thrown away, but you’re also forgoing packaging from a store-bought product. I’ve found that transitioning to a low-impact lifestyle can be daunting, but what we eat doesn’t have to be. 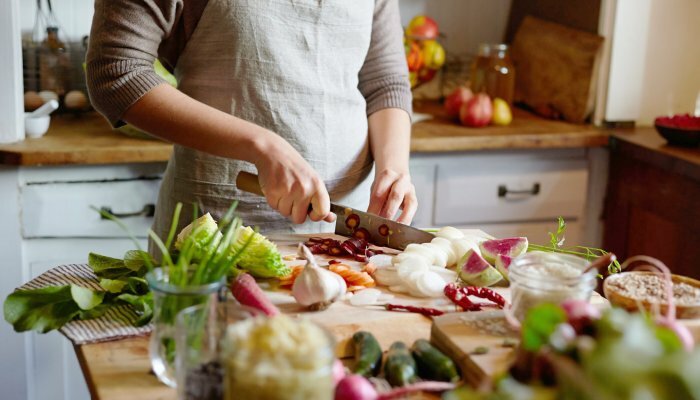 By remembering to close the loop in your kitchen—be it by making your own ACV, cooking up vegetable broth using scraps, or finding creative ways to reuse old containers—you’ll exercise your power to make a difference as a home cook and eater every day.